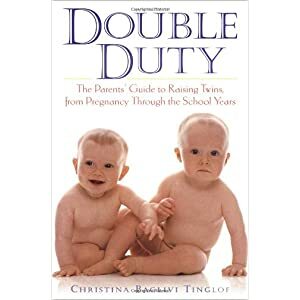 Next up, I'm going to review Double Duty: The Parents' Guide to Raising Twins, from Pregnancy Through the School Years by Christina Baglivi Tinglof. I'm going to review the 1998 1st edition, rather than the 2009 2nd edition because, well, that's what I got from the library. I assume the second edition is fairly similar, but with fewer references to VCRs. At first this book intrigued me. Most books that we've been looking at focus on pregnancy and the first year. While this makes sense for us now, it seemed like it would be neat to "peek ahead" with a book that had a little less about pregnancy, a little more about the first year, and a couple of chapters about life beyond that. Try not to refer to your children as "the twins". Really? Most parents I know talk about "the kids", "the boys", "the girls", etc. More to the point, why not? After some discussion, Christina (my wife, not Ms. Baglivi Tinglof) and I decided that it was reasonable to refer to them as "the twins" in the third person -- as in, "We just dropped off the twins with their grandparents, and we're headed for Vegas." It did, however, seem inappropriate to address them as such. ("Twins, get in here!") If we're going to be accused of causing lasting psychological damage to our kids, I'd at least like to know why. Reading the introduction, I see how the book was constructed. The author interviewed a bunch of parents of twins, and a pediatrician, and compiled the advice she got. The result, unfortunately, is a mix of good and bad advice, with little way to distinguish between the two. African races have the highest incidence of twinning (about 20 percent more likely than Caucasian women), followed by Europeans, then Mexicans. Asians have the lowest incidence. Question: "Twins? How do you tell them apart?" Answer: "We had only one twin circumcised." OK, at least we laughed at that one, but it seemed a little inappropriate. In short, I can't recommend this book; there are too many other, more carefully written books about twins out there. Even those which are also collections of advice are more explicit about the source of and reasoning behind that advice. This one's going back to the library soon.